Memorial Day is actually an interesting connection to our discussion today. Because maybe some time during this weekend, between barbecuing and swimming, you’ll take a moment to appreciate the freedom you have that was made possible by those who paid the ultimate price for our country. But you would feel the weight of sacrifice more if you opened a book and read a few stories from one of the wars in our nation’s history. But you would feel the weight of sacrifice even more if you closed the book and took a field trip to Arlington, Virginia and walked the grounds of the National Cemetery. And as you passed the thousands of perfect rows of little white crosses marking the graves of soldiers from American wars, and as you crossed the valley of hundreds of thousands of crosses it would lead to another valley of hundreds of thousands of crosses… eventually the sheer magnitude of half a million gravestones would overwhelm you, and you would feel the weight of sacrifice even more. But as meaningful as that experience would be, it wouldn’t compare to what you’d feel if you were a father visiting just one of those gravestones with flowers in your hand. 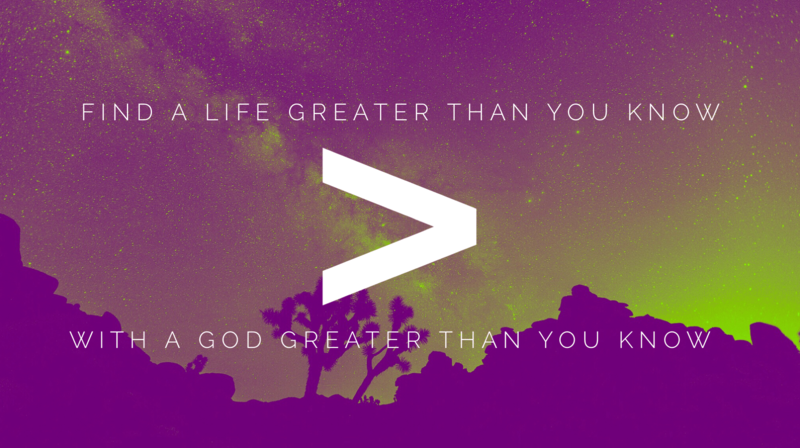 Today we continue our series Greater Than, as we journey with Abraham, Isaac, and Jacob and discover alongside them “a life greater than you know with a God greater than you know”. For three weeks it feels like we’ve been going at light speed. We’ve crossed decades from the first moment Abram is called by this God he doesn’t know to a land he doesn’t know, and we’ve gotten snippets of moments and conversations along the way. But in today’s account, I don’t know if I ‘d call it a highlight–I don’t know what I’d call it–but today our series brings us to the story of God calling Abraham to sacrifice his son, Isaac. It is a challenging, and frankly disturbing story. My mother-in-law hates this story. When my son heard it for the first time he asked, “Why would God do that?” And he’s right, it bucks against our understanding of who God is. And we want to rush past this story to move on to something more enjoyable but we can’t because the writer just sort of slows down. They press the slow motion button and we get vivid details and repetition of words. The reason the writer doesn’t want us rushing through the story? They want us to feel the full weight of sacrifice. The writer closes the textbook and takes us on a trip to Arlington with flowers in our hand. And when we pause and reflect on the account at the speed with which the writer intends, not only does the account make Abraham’s trial become more understandable, but we begin to understand our own trials differently. So today, if you are in a difficult season. If you are hard-pressed and at your breaking point. If you are in a trial that makes you question God. I know the bills are high. I know the relationship seems impossible to bear. I know pain is wearing on your spirits. But today is for you. But I’m inviting you to take a deep breath and look at this account with me. Because once we put those trials in perspective, this account gives a tool you can immediately apply to help you face your trials and begin to live a life that’s greater than the life you know. Today’s account happens on a place called Moriah. It’s a region of hills in Israel and the word Moriah means “my teacher is Yah”, as in Yah from Yahweh or, in Latin, Jah from Jehovah. So as a reader, we should know that this is a teaching, where God is going to teach us what we do not know. And our heart should be right. He is teacher, we are students. He is superior, we are subordinate. He is God, we are not. He knows more than you, my friends. And so much changes when you stop approaching God with your answers and start approaching Him with your questions. I know we just got into today’s text, but right away we have some things I need to address. First, when you think test, you think of being tested on what you know. Like you take a math test to test if you know your fractions. You take a driving test to test if you can drive a car. But remember Moriah. Your teacher is Yah. God uses the test to teach you. Can you read that with me? This is more like refinement. Where fire burns away impurities and weaknesses until something pure emerges. That kind of test. This is important to keep in mind because it’s important to remember that God never intended for Abraham to carry out the test fully. We’ll see why later on. But this was a test, this was only a test. Second, I know we just got into today’s account, but we also that Abraham’s test had his name on it. It was purposeful. He couldn’t take his wife’s Sarah’s test. Sarah couldn’t take his test. This is what God wanted to teach Abraham based on the purpose God had for Abraham. Your test has your name on it because your test has his purpose in it. For all you’re feeling right now, it’s a sliver of what Abraham is feeling. I confess to you now, I couldn’t do it. I would have told God no. I would have blamed the voice I heard on indigestion. Sarah’s cooking. I couldn’t do it. But, look at what the writer does here. He stresses son. Your only son. In fact, we’ll see seven uses of the word son and each time, the number symbolizes something Abraham is feeling and something God’s is teaching us. I don’t have the time to unpack each use but right here, with the first use of son, it stresses his singularity and preciousness. The point is, the horror you feel is intentional. You’re on a field trip to Arlington with flowers in your hand. We feel the ironic pain of waking up his son to lay him to rest. We see him cutting wood in agony. We see him journeying for three days in despair. God didn’t say go down the hill, or ride for a couple hours, he told him to ride for three days. Lie awake for two nights. Feel this pain, Abraham. We’re on a field trip to Arlington with flowers in our hand. A couple thousand years later a man named Paul picked up on this phrase “we will come back to you”, and tells us that Abraham believed God would raise his son, Isaac from the dead. Abraham had already seen the closed womb of a 100-year-old woman open up and birth a son in spite of her wrinkles, her brittle bones. Abraham had seen resurrection before, and he believed God would resurrect him again because God had also promised him that his son Isaac would give Abraham descendants as numerous as the stars in the sky. If this is true, then Abraham reasons God must intend to raise his son Isaac from the dead. It doesn’t make this account any more palatable. But it does give us a glimpse into Abraham’s thought process. If you notice, Isaac is old enough to carry the wood, he’s old enough to fight a 100 year-old man. A point that becomes interesting for us later on. And the two of them went on together. A point that will become important in a moment. 9 When they reached the place God had told him about, Abraham built an altar there and arranged the wood on it. He bound his son Isaac and laid him on the altar, on top of the wood. 10 Then he reached out his hand and took the knife to slay his son. Here the tension of the story reaches a boiling point. Our mind is screaming to stop. I don’t think it’s a coincidence this is the seventh time we get the Hebrew word “ben”, or son. 12 “Do not lay a hand on the boy,” he said. “Do not do anything to him. Now I know that you fear God, because you have not withheld your only son from me. Because now when you see His only Son breathe his last on an altar of two wooden beams you can’t not see Abraham and Isaac, all over again. You recognize holiness is so holy that the punishment for sin is death. You recognize that you are Isaac, you break free from the sin that binds you and get up from the altar because the Son of God, the Lamb of God, took your place, took your sin, and took your penalty as his own. You recognize that Jesus is the God Himself providing Himself as the Lamb to take away the sin of the world. But that’s not all you recognize. Because God uses the test to teach you, you also recognize what your heavenly Father feels. You recognize just how great your heavenly Father loves you that He would do the unthinkable, the agonizing, the gut-wrenching, to save you. That he would send His Son to die? And you recognize it because of this story with Abraham made you put down the text book and go on a field trip to Arlington with flowers in your hand. Abraham renames Moriah The Lord Will Provide. Almost as an answer. My teacher is Yah, and Abraham memorializes what he learned, and names the Lord, Yahweh Yireh, the Lord Will Provide. Every time I see people tested in Scripture, what they end up learning is who God is. Because some things about God can only be taught in the test. Abraham walks up the mountain consumed with thoughts about himself. Abraham walks down the mountain consumed with thoughts about who God is. And this is where your trials come in to perspective. I know you’ve got challenges. You’ve prayed for relief. You’ve prayed for healing. You’ve prayed for freedom. But I want to introduce something new for you to pray. The prayer prescribed for you in this account. God, what do want me to learn about you in this test? Worse than being tested is not learning what the test is teaching and having to keep take the test over and over. So how about we try something new, my friends. Because listen, listen–could it be, that once you learn what God wants to teach you about himself in the test, maybe you’ll be ready for what’s needed next? While Abraham is taking the test, climbing the mountain, the entire time, there was a lamb. Which means, listen– As Abraham is tested, the answer God provides is climbing the other side. As Abraham is tested, the answer God provides is climbing the other side. The answer God provides is climbing the other side. So keep climbing. Your answer is sent. Your answer is coming. Your answer is waiting. Not at the start of the journey. Not at the bottom of the mountain. At the top of the mountain. On the altar. Because his name is the Lord will provide.